FILE - Members of a Taliban breakaway faction walk during a gathering, in Shindand district of Herat province, Afghanistan, May 27, 2016. A senior U.S. official has urged the Taliban to engage in peace talks with the Afghan government. 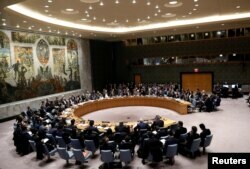 "Victory cannot be won on the battlefield — a solution is and must be political," Deputy Secretary of State John Sullivan told a high-level meeting of the U.N. Security Council on Friday. "We must recognize the reality that, while the Afghan government has been adamant about its interest in initiating peace talks with the Taliban, there has been no reciprocal interest on the part of the Taliban," Sullivan said. "That must change." He said any peace deal must include a firm commitment from the Taliban that they will cut ties to terrorism, cease violence and accept the Afghan constitution. 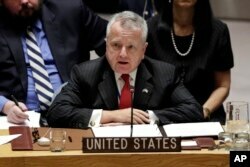 U.S. Deputy Secretary of State John Sullivan speaks at the United Nations Security Council, Jan. 19, 2018. "To achieve this end, we must work together to isolate the Taliban, eliminate their sources of revenue and equipment, and demonstrate with a united and unwavering commitment that the only place they can achieve their objectives will be at the negotiating table — not on the battlefield," he added. In August, U.S. President Donald Trump announced his strategy for ending the 16-year war in Afghanistan. He said it would include deploying more U.S. troops to the country and intensifying pressure on neighboring Pakistan not to harbor terrorists. He said his policy would not focus on nation-building, but on "killing terrorists." Sullivan said there had already been joint U.S.-Afghan progress against Islamic State terrorists in the eastern part of the country, reducing their territory and eliminating a third of the group's fighters. Afghanistan's Deputy Foreign Minister Hekmat Khalil Karzai echoed this, saying Afghan Special Forces had carried out more than 2,000 operations in the past 10 months, causing major losses for militants and foreign terrorist fighters. Members of the Security Council gather for a meeting on building regional partnership in Afghanistan and Central Asia at the United Nations in New York, Jan. 19, 2018. Earlier this month, the Trump administration announced it would suspend $1.9 billion in aid to Pakistan until Islamabad took "decisive action" against the Afghan Taliban and the Afghan insurgent group known as the Haqqani network. "We seek to work cohesively and effectively with Pakistan, but cannot be successful if the status quo, one where terrorist organizations are given sanctuary inside the country's borders, is allowed to continue," Sullivan told the council. "Our ability to totally eliminate terrorist acts in Pakistan depends on effective control of our long border with Afghanistan," Pakistan's U.N. ambassador, Maleeha Lodhi, told council members. "We have enforced stringent border management measures on our side of the border and look forward to Afghanistan matching what we have done on their side of the border." Lodhi added that Pakistan is committed to not allowing its territory to be used for attacks against any country.